1. 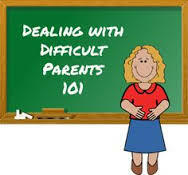 Let upset parents know that your goal is to help every child succeed. Look for ways to find common ground. Tell parents that both of you want what’s best for their child and that you want to find ways to work together. When parents are able to look at the big picture and realize that you are on the same side, you can begin to work together to help their child succeed. 2. Be sensitive! No matter how tense a situation becomes, always remember that your student is someone’s precious baby. Open your conversation with parents by acknowledging the child’s strengths before you focus on areas of concern. 3. Good records that document dates, times, notes and decisions about students can be invaluable if problems arise. Keep track of communication you’ve had with parents throughout the school year. Make a set of parent communication folders by labeling file folders with the names of your students. Staple a few blank sheets of paper inside each folder. Use these folders to jot notes with details of important conversations and keep notes from parents organized. Inside each folder, write the date, name of the parent with whom you spoke, and any actions that need to be taken. Make sure to date notes that you receive from parents before you file them in the folders. If you respond to a parent’s note in writing, make a copy of your response and staple it to the parent’s note. After making phone calls to parents to discuss problems, take a few minutes to record any important information that was discussed. Parent Communication Files come in handy if you ever need to document how you’ve involved and informed parents after an incident at school. Keep these important folders inside the front of your desk drawer so they are at your fingertips instantly. 5. Be prepared to give specific examples to illustrate the points you make. Show parents examples of average and above average work for your grade level. White out the names on papers and use actual samples of students’ work to clearly illustrate typical work for the grade level. The idea isn’t to compare students to one another, it’s to give parents a clear idea of exactly what your expectations are for students in your class. 6. Have you ever been caught off guard by a parent and answered a question in a way that you regret later? If a parent asks you a question that floors you, don’t be put on the spot. It’s fine to let parents know that you need some time to reflect on their question before you respond. Let them know that you’ll get back to them in a day or two. Relax—you’ve just bought yourself time to explore options and perhaps bounce ideas off of a colleague before you respond to the parents. 7. Don’t be afraid to end a meeting with parents who become confrontational. Sometimes, the best thing to do is to provide an opportunity for all parties to cool down and reflect on the issues at hand by bringing the meeting to a close. Set a time and date to meet again. If you feel threatened, ask your principal, vice principal or school counselor attend the next conference. 8. It’s awkward when parents share too much information with you. While it’s helpful to know things that directly impact a student, it can be problematic when parents disclose too much personal information. It’s not your job to be their therapist. Remind parents that during the limited time you have to speak with them, that you need to focus on their child and not on them. 9. Sometimes neighborhood issues spill over into the classroom. Don’t let yourself get dragged into disputes between families of children in your class. Problems escalate quickly if it’s perceived that you’re siding with other parents. When parents begin to share information about neighborhood squabbles, jump right in and tell them that it’s information that you don’t need to hear. Let parents know that you’re receptive to their thoughts and ideas about their child, but you must stay out of personal issues between the families. 10. Watch for parents who hover relentlessly. I had a parent my second year of teaching who expected to volunteer in my classroom all day every day. I welcome parent volunteers, but this was ridiculous! She actually burst into tears when I told her she could only work in my room for an hour or two each week. I let her know that her daughter needed the space to develop social skills and gain independence. Then I told her about all of the other volunteer opportunities available at the school. Before long she was busy helping in the library and active in the PTA. This entry was posted on August 3, 2014 at 12:23 am and is filed under Dealing with Parents. You can follow any responses to this entry through the RSS 2.0 feed. You can leave a response, or trackback from your own site. I wish the parents of my students would listen to the teachers.